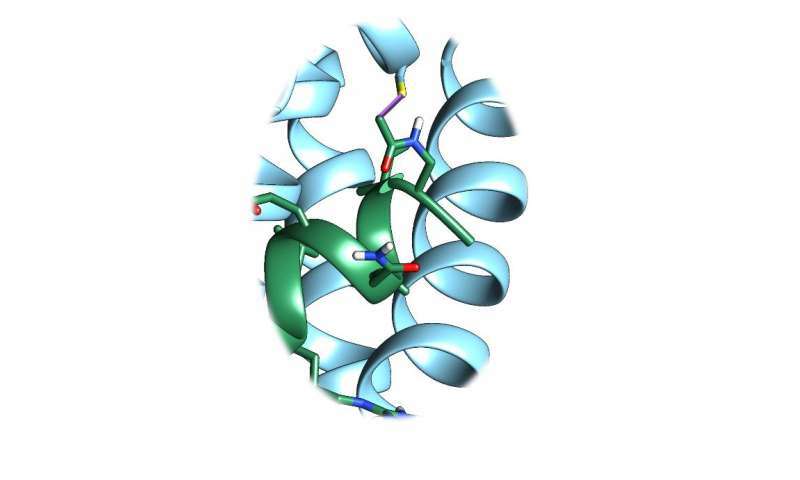 Image shows a close-up view of the structure of Bfl-1 (light blue ribbon with yellow stick representing a sulfur atom) in complex with the inhibitor 130G4 (green ribbon with red, oxygen, and blue, nitrogen, sticks). The bond between the Bfl-1 sulfur atom (yellow) and 130G4 is highlighted by a magenta stick. Credit: Pellecchia lab, UC Riverside. Every cell in our body produces pro-death proteins and anti-death proteins, which interact with each other, negating each other's function. A healthy balance between them is a natural process. A damaged cell, for example, produces more pro-death proteins than anti-death proteins, resulting in a natural elimination of the diseased cell, a process also known as apoptosis. Pro- and anti-death proteins are therefore termed pro- and anti-apoptotic proteins, respectively. "What we discovered is that while these early studies done with the mouse versions of the proteins NOXA, Mcl-1, and Bfl-1 were correct, these do not entirely apply to human proteins," said Pellecchia, a professor of biomedical sciences and the Daniel Hays Endowed Chair in Cancer Research. "This is because human NOXA and Bfl-1 are different from their mouse counterparts. Indeed, we found that when we profiled human NOXA against human anti-apoptotic proteins, the highest affinity was for Bfl-1, and not for Mcl-1, making Bfl-1 a much more relevant drug target than previously assumed." Pellecchia's lab found that NOXA interacts with Bfl-1 through a unique chemical bond (a "disulfide bridge" between unique sulfur atoms present on each protein) not seen in the other five anti-apoptotic proteins. "Understanding how NOXA interacts with Bfl-1 allowed us to devise in the lab a surrogate NOXA-like molecule that very tightly and permanently binds and inhibits Bfl-1," Pellecchia said. "In proof-of-concept studies with cells from patients affected by chronic lymphocytic leukemia that are resistant to chemotherapy, we showed that if we block Bfl-1 with this innovative inhibitor, the cells begin to die in response to treatment." "Academics and pharmaceutical companies are spending considerable amount of effort and resources in finding antagonists to Mcl-1," Pellecchia said. "While these agents are surely useful in certain conditions that are exacerbated by over-production of Mcl-1, we have shown that more focus on Bfl-1 is warranted. Our research provides new insights on the mechanisms of cancer resistance to chemotherapy, suggesting Bfl-1 as a viable drug target, and also provides a direct path on how to develop Bfl-1-targeting drugs."